Recently inflation has fallen sharply in most European countries and in some countries we already have deflation, and it is very likely that deflation will spread to several European countries in the near future. In Sweden inflation has already fallen below zero , as is the case in several southern European countries. There is certainly reason to fear deflation. In the 1930s deflation was allowed to spiral out of control and the consequences were disastrous. But in this context it is extremely important to remember that there are good and bad deflation. The overall price level in the economy may fall for two reasons. First, productivity increases may cause prices to fall. As will falling input prices – for example lower oil prices. Second, a general contraction in aggregate demand – for example due to tighter monetary policy – can reduce the price level. Economists normally call productivity increases and falling oil positive supply shock. They are unilaterally positive as an positive supply shock overall increases prosperity. That’s the good deflation. Conversely a general decline in prices, which is a result of weak aggregate demand – a negative demand shock – is purely negative as it usually leads to higher unemployment and lower capacity utilization in the economy. That’s the bad deflation. In general the economic development in Europe in the last five years has been characterized by very weak demand development. It has created ​​clear deflationary trends in several European economies. That certainly has not been good. It has been a bad deflation. However, the recent decline in European inflation we have seen is primarily a result of falling oil prices – that is a good deflation, which in shouldn’t be a worry. The paradox is that these recent (positive) deflationary trends in the European economy seems to have caused the European Central Bank to wake up and reduce interest rates and it is now being speculated that the ECB will undertake further action to ease monetary policy. According to the monetary policy textbook central banks should not respond to “good deflation”. 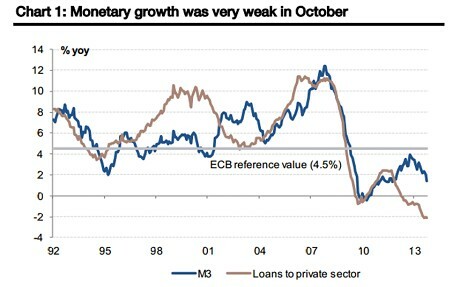 This obviously could give reason to question the fact that the ECB is now finally moving to ease monetary policy. But the truth is that the ECB in the past five years have failed to sufficiently aggressively ease monetary policy to to avoid bad deflation. Therefore, one can rightly say that the ECB is doing the right thing by easing monetary policy, but basically for the wrong reasons. But let’s just be happy that the ECB finally makes the right decision – to ease monetary policy – even if it is not for the right reasons. The big question is now how the ECB will ease monetary policy when interest rates are already close to zero. But this “problem” is easily solved. A central bank can always ease monetary policy – even when the interest rate is zero. The Federal Reserve and Bank of Japan have solved this problem. They have simply increases the monetary base. The ECB has so far been very reluctant to move in this direction, but the fact that we are now moving toward deflation in the euro zone may also cause the ECB to move forward in this field. Let’s hope so – because if the ECB does not move in this direction we’re going to have ongoing problems with deflation – bad deflation – in Europe very soon. Eurozone money supply growth plummeted in October and loans to firms contracted at a record rate, heightening the risk of a stalled recovery and Japanese-style deflation next year. The European Central Bank said M3 money growth fell to 1.4pc from a year earlier, lower than expected and far below the bank’s own 4.5pc target deemed necessary to keep the economy on an even keel. Monetarists watch the M3 data — covering cash and a broad range of bank accounts — as an early warning signal for the economy a year or so in advance. “This a large dark cloud hanging over the eurozone in 2014; it means the public debt ratios in Southern Europe are at greater risk of exploding,” said Tim Congdon from International Monetary Research. So yes, we are seeing some good deflation in the euro zone at the moment and we should be happy about, but unfortunately we are likely to see a lot more bad deflation soon if the ECB does not get its act together soon. The problem is that unconventional tools such as QE require fiscal cooperation. This is not obvious in the countries that have used it so far, because there is a 1 for 1 relationship between the central bank and the government. But that’s not the case in the Euro area: there are seventeen fiscal authorities all producing their own debt, and some of them are distressed. There is as yet no agreement on pooling debt, and there are legal and political obstacles to the ECB buying large amounts of government debt. QE would be likely to fall foul of ECB legislation prohibiting monetary financing of governments, it would quite possibly also fall foul of German constitutional prohibition of market manipulation and it would make the conditionality of OMT impossible. From a monetary point of view it makes sense, but politically, I fear it is a non-starter. Frances, I can’t see any problem in the ECB buying a GDP-weighted basket of euro zone government bonds until for example M3 growth is a at 10% y/y and keep buying until M3 growth have been 10% for 3-4 years. The ECB is already buying euro zone government bonds and there would be no moral hazard problems if the ECB where buying a GDP-weighted basket of govies. Remember the purpose is exactly not to influence bond yields, but to increase money base growth to in broad money growth and hence ensure 2% inflation over the medium-term. This is what the ECB is mandated to do. At the moment the ECB is failing to deliver 2% and we are clearly risking financial and economic instability as a result. This is clearly in clear conflict with the ECB’s mandate. Lars, I don’t disagree at all. But I fear Mr Weidmann does, along with the political establishment not only in Germany but in other “surplus” countries. It’s sensible from an economic point of view, but politically it is a minefield. Yep, Frances. We all know that it is political at this point. The Germans don’t trust the ECB, and already scared of their existing exposure to sovereign risks. The ECB’s balance sheet contraction is something that to me suggests that there are limits to the “more Europe”-crowd. Anything goes, except balance sheet risks. Or perhaps Germany believes that the crisis countries will at some point partially default and exit the currency union anyway, so QE would be a balance sheet risk. This suggests to me a terrible understanding of macro, as the fiscal multiplier-fiasco showed. One should not forget how Germany handled the unification of the East- and West Germany, and how Bundesbank’s monetary policy aggravated the ERM-crisis in 1992. A currency union with Germany is bad economics, so the least the other members should ask is for Germany not to optimize policies for their own use, but for the euro area as a whole.